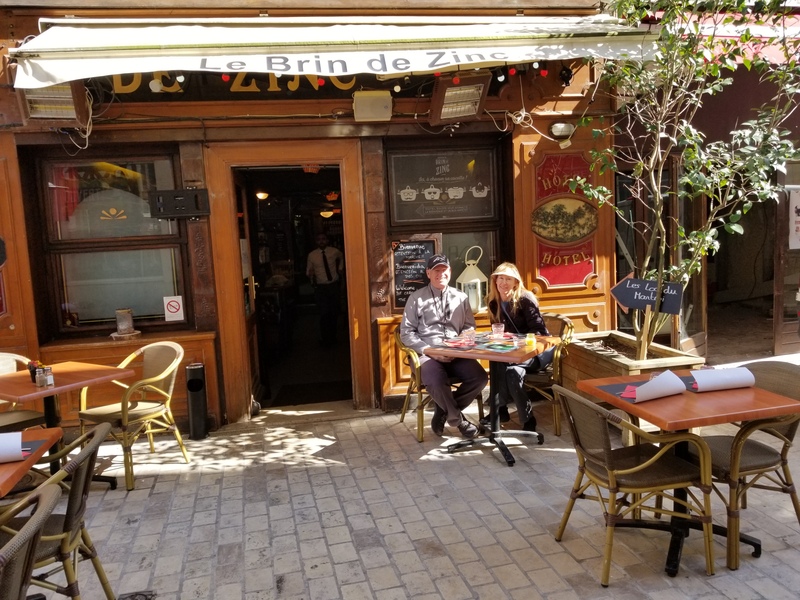 This is the second post recounting our Vacation in France. Here is the first…. Our pre-cruise tour was set up to take us from Paris to Bordeaux with two nights in the city of Tours France. We arrived the day before and had time to explore on our own. On Thursday we woke up, got our bags out to the hallway and went downstairs for breakfast – which was great. After breakfast we headed out to the lobby where the other “tourists” were beginning to gather. Our bags had already been carried downstairs, were loaded onto a tour bus and we all climbed aboard. There were only 17 of us on a full size bus so we had plenty of space to spread out, though some of us grabbed the first few rows. We were given some free time to get lunch and to wander on our own. Cheryl and I decided to have our first real French meal. We stopped at a quiet sidewalk cafe and ordered their daily special… Pork as I recall… very good. We reboarded and headed south toward our next stop – Château de Chambord. The Chateau was built as a hunting lodge by one of the french Kings…. a hunting lodge… if you can believe it. After the Chateau we headed to Tours where we checked into our reallly nice hotel, were treated to a nice dinner and settled in for the evening. Next we traveled into another village, where we had a brief tour and time on our own. Cheryl and I had a sandwich from a local bakery. Then I took a quick tour of yet another Château overlooking the city… on my own.. while Cheryl rested. Most of the others spent their free time having nice lunches at the many fine restaurants that there were in town. Our next stop was back in Tours. We had a brief walking tour and had the option of staying in town to wander and have dinner, or to take the bus back to the hotel… about a mile away. Cheryl and I stayed and wandered for a bit. We opted not for a big expensive dinner, but instead found a frozen yogurt place. Then we walked back to the hotel. By now it was late afternoon, and I had not gotten a run in yet, so I put on my running shoes and ran back to town, to the river and had a running Tours tour of my own. The final day of our pre-cruise tour was mostly a bus ride from Tours to Bordeaux. We did stop in Potiers, however, along the way..
And then we arrived at the Viking Forseti in Bordeaux France around 5 in the afternoon. Dale, So happy for you guys…We spent ~ three years in The Netherlands as an Air Force kid… love northern France!